Taylor Swift is releasing the official concert film of her 1989 world tour as an Apple Music exclusive next Sunday (December 20). Swift will appear on Zane Lowe’s show on Beats 1 at 9am PST tomorrow (December 14) to talk about the film – ‘The 1989 World Tour LIVE’ – which was recorded in front of 76,000 people in Sydney on November 28. 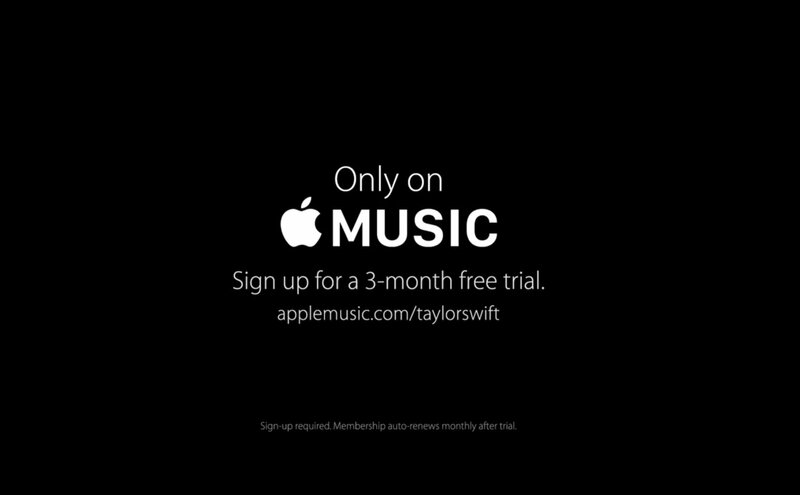 Understandably, Apple is encouraging those Taylor Swift fans who wish to see the film to sign up to the three-month free trial of Apple Music in good time. The Apple Music deal for Swift’s concert represents the first occasion that a major piece of video content has been locked down as a platform exclusive in the world of streaming music – although TIDAL has shown some live concerts in the past. The Apple and Taylor Swift partnership comes less than six months after the pair publicly made up following the artist’s call for the company to pay artist royalties during Apple Music’s free trial period. Interestingly, although Universal Music Group distributes Swift’s studio recordings – her catalogue is owned by Scott Borchetta’s Big Machine Label Group – the same is not necessarily true for the video of her live performances. As such, the 1989 concert exclusive could well have been secured via a direct deal between Swift’s team and Apple. Perhaps the bigger question, therefore, isn’t how much Apple shelled out for the new Taylor Swift exclusive… but who paid to create the video in the first place. It took her little more than 12 months to ink an exclusive content deal with Daniel Ek’s biggest rival. Swift’s album catalogue has also been available to stream in full on Apple Music since day one. Directed by Jonas Akerlund, The 1989 World Tour LIVE concert film captures Swift’s entire performance from Sydney including footage filmed backstage and during rehearsals with special guests such as Mick Jagger. The 1989 World Tour LIVE also includes appearances by: The Band Perry, Beck, Dierks Bentley, Mary J. Blige, Charli XCX, Jason Derulo, Echosmith, Fetty Wap, Selena Gomez, Ellie Goulding, HAIM Fifth Harmony, Imagine Dragons, Nick Jonas, Alison Krauss, Lisa Kudrow, Miranda Lambert, Avril Lavigne, John Legend, Leona Lewis, Little Big Town, Lorde, Natalie Maines, Ricky Martin, Idina Menzel, Alanis Morissette, Rachel Platten, Nelly, Pitbull, St. Vincent, Justin Timberlake, Tove Lo, Steven Tyler, Keith Urban, Walk the Moon, The Weeknd and Wiz Khalifa. Other Apple Music streaming exclusives this year have included Pharrell Williams’ single Freedom, which was premiered on the platform when it launched in June. Apple Music also continues to exclusively host the stream of Dr Dre comeback album Compton, which was released in August.